Glyceryl Rosinate, Paraffinum Liquidum (Mineral Oil), CI 77891 (Titanium Dioxide), Aloe Barbadensis Leaf Extract, Caprylic/Capric Triglyceride, Tocopheryl Acetate, CI 61565 (Green 6). 1. Remove plastic lid; slide protective collar onto wax container and place container in warmer. 2. Heat wax until it has a thin, syrup-like texture. 3. Cleanse area to be waxed with Satin Smooth® Satin Cleanser® Skin Preparation Cleanser. 4. With wooden spatula, apply a thin layer of wax to skin in the direction of hair growth. Place epilating strip over waxed area; smooth firmly in the direction of hair growth. 5. Hold skin taut. Pull epilating strip quickly in opposite direction of hair growth, keeping epilating strip close to skin. Never reapply wax in the same area. 6. 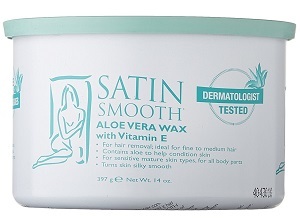 After area has been completely waxed, apply Satin Smooth® Satin Release® to remove any wax residue on skin surface.